Here are a few guidelines for how to do social media scheduling like a pro. We’ll also use the Rignite social media management tool to show you ways to make your life easier using a powerful tool for scheduling tweets and facebook posts. Schedule often. It’s a busy, noisy world out there, and you’ll want to keep your audience engaged with fresh posts. Schedule at the best times. Determine when your fans are most likely to be online. Here’s how to find the best times on Facebook. Use visuals to grab attention. Images catch the eyes of people as they scan posts, and give them a hint of topic of your post. 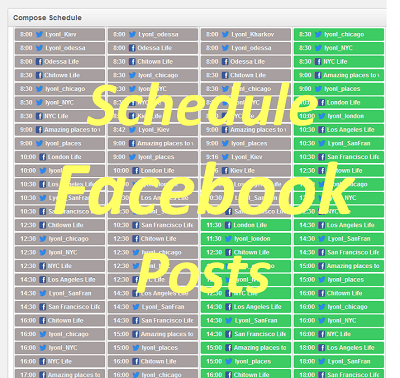 Create a social media posting schedule. Have a good idea of what type of content you plan and the timing of it. Scan news sites, blogs and social media for content. Schedule post of interesting links, and retweet, share, and like posts regularly. Of course, there are many social media scheduling tools like Rignite to help you publish your tweets. And they do a lot more than that too. 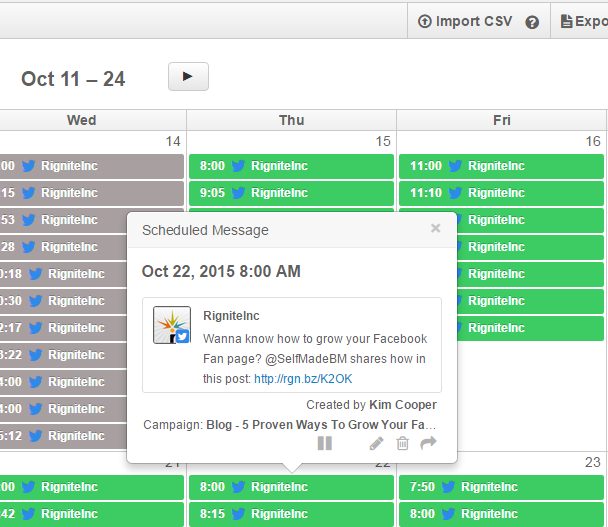 Rignite is a software solution that makes it easy to schedule, track, and manage your posts. 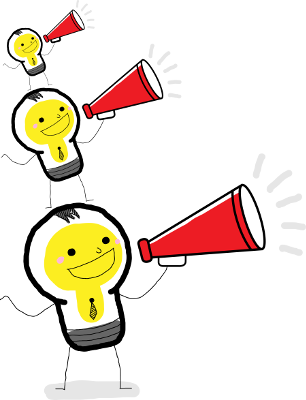 Include Mentions and Hashtags to Increase Visibility. Including relevant hashtags for your topic will increase the chances that someone will discover your post. Post Frequently, But Not Repeatedly. You should be posting many times a day on Twitter. But don’t post the same thing without a break, or you’ll bore your audience and might get blocked by Twitter for a duplicate post. Ask Questions for Engagement. Asking people to respond to controversial, emotional, or intriguing questions can increase your engagement. One of best campaigns is a giveaway promotion on Twitter. If your goal is to boost engagement a tweet or re-tweet giveaway or photo contest can do it. Rignite provides a campaigns module to guide you through setting up your promotion. You select Boost Engagement and begin your Twitter promotion setup. One to three rotating base messages to post. 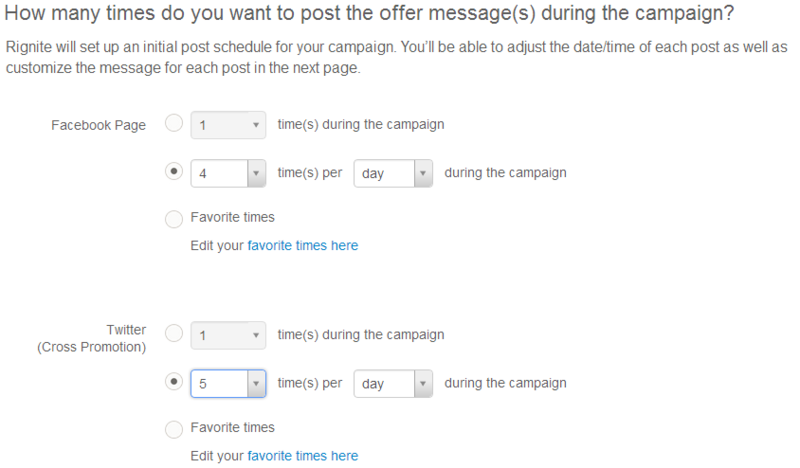 Then select how frequently you want to schedule your tweets and Facebook posts and click Kickoff. Your calendar will be automatically filled with posts for your giveaway or contest. This will save you tons of time scheduling your posts, especially if your promotion runs for a few weeks or even months. When your promotion is over pick a winner or randomly select one. Then Rignite will guide you through the winner notification posts. You can easily schedule dozens of tweets for a campaign to promote other things too. A basic series of posts as part of a campaign is also easy in Rignite. You’ll schedule both tweets and Facebook posts for the duration of your campaign. Your campaign could be weeks or months long. Promoting an event with a steady drumbeat. In Rignite, create multiple base messages which will be rotated on your tweet and post schedule. You can even add Google Analytics tracking parameters to all your posts. Then select the frequency of posts. This can be different for your tweets than for your Facebook posts. It’s easy to edit, add, and move your tweets to customize your schedule. After finishing, you’ll have a calendar full of scheduled posts. Rignite is a software solution that makes it easy to schedule, track, and manage your Twitter campaigns, including giveaways, contests, and sales. Use Eye-Catching Images. When people scan their news feed an eye-catching image will attract them to a post. Ask for Responses. Don’t be afraid to ask your fans to respond. People are more likely to respond to controversial or emotional questions. Vary Your Content Categories. Use a mix of educational, informative, humor, and inspirational posts. This will keep your fans engaged. Boost Important Posts with Ads. Because organic reach for your posts will be low consider using advertising budget to increase post reach. Running a giveaway on your Facebook page is a great way to generate engagement. Cross promoting on Twitter. Rignite can automatically insert the link to your Facebook promotion into your future tweets to direct people to your Facebook post. Se lect how frequently you want to schedule posts and your calendar will be automatically filled with promotional posts for your giveaway or contest. You’ll save a lot of time scheduling your posts, especially if your promotion runs for a few weeks or even months. After your giveaway has ended you’ll be able to select a winner or have Rignite randomly select one. Rignite can announce the winner in your original posts and tweet it too if you’d like. You can also see Campaign-level analytics to see how your campaign performed and be able to compare it to others. You might want to run other social media marketing campaigns besides giveaways. With Rignite you’ll be able to promote these with a series of posts. Your campaign can be a few days, weeks or even up to six months. In the Rignite campaigns module you’ll be able to create multiple base messages, which will be rotated so that you’re not always posting the same thing over and over. Just select how many times to post your message, which can be different for your Facebook posts than your tweets. This is a great way to fill your calendar with a series of rotating posts! Tweet and post daily any news, updates or time sensitive posts. Adjust your post schedule for daily events, or to fill in any gaps. Evaluate the content of your social media scheduling weekly for the proper mix. The Rignite Schedule view gives you the big picture calendar of your tweets and other posts. All of these tools will help you become a social media scheduling pro! Hey Sam! Great article, loads of info! I am curious about the scheduling a tweet, say for example 3 times/day – if its the same message, doesn’t twitter stop the duplicated messages from posting? Hello, yes they will block duplicate posts. With Rignite Campaigns you can rotate up to three different messages automatically to try different approaches and avoid this issue.